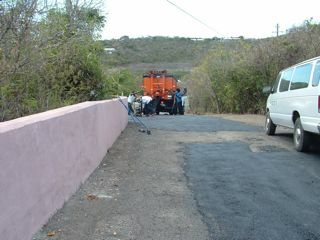 The commissioner of Public Works, Mr. Darryl Smalls and Road Crew Supervisor, Mr. Sean Brown are getting the job done! 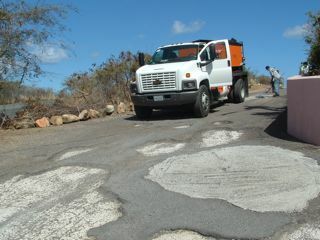 Yesterday the road crew repaired some very nasty potholes and road conditions on the lower Flamingo Bay road. They also continued filling potholes on north Limestone road. A total of about 5 tons of asphalt were used yesterday which brings the total to around 35 tons of asphalt laid down this year! Thank you Commissioner Smalls!! 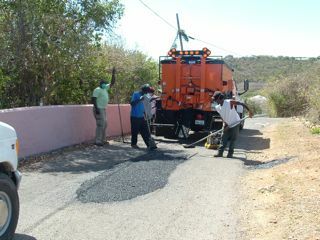 Another 4 tons of asphalt was laid down on Water Island roads by the Department of Public Works last Friday. This brings the total to almost 30 tons! The areas done last week were the main road at the ferry dock and the "Overdown" road leading to Flamingo Bay. Also, the Roadside Cutting Crew will be returning to the Island the first week of June! 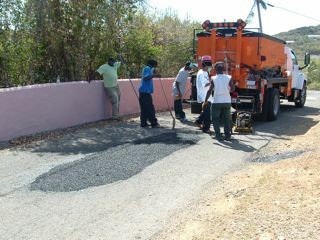 Road repair work continues on Water Island. 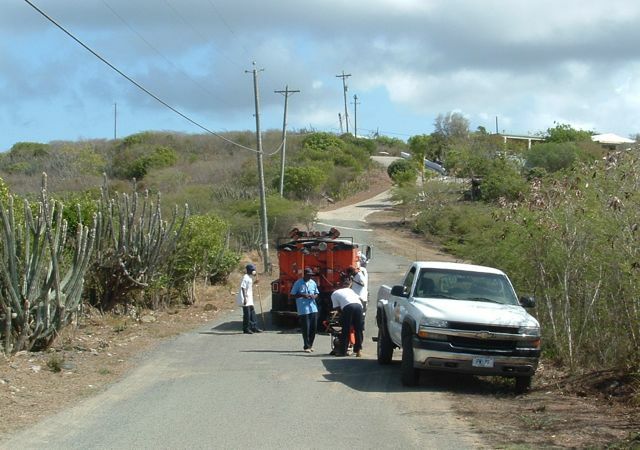 Today another 12 tons of asphalt was used to patch potholes around the Island. Two Department of Public Work crews, lead by Road Supervisor Sean Brown, made a significant advance in improving our roads. Mr. Brown advised that they will be returning in May. To date we have had approximately 25 tons of asphalt used on our roadways. ALL roads will eventually be repaired.